Gamebooks are easy and fun, playing them is not much more complicated than reading a book. But there are a few things you may want to know if you have never read a gamebook before. Lets get started! Once you open the app and watch the intro video, you will find yourself in the main menu. The main menu is where you’ll start off. For now just tap the “Play” tab. This will take you to the book cover. 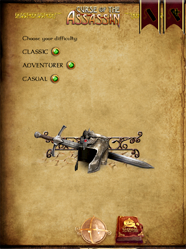 Tap the book cover and you will be presented with the three main difficulty settings for the game: Classic, Adventurer and Casual. To flip to the next page either tap the right side of the screen, or simply swipe from right to left, just like turning a page in a real book. Choose a difficulty mode by tapping the green button next to them on the last page. Once you choose a difficulty, you will get the chance to roll your character stats. If this is your first gamebook, try Casual mode. First thing to do is to enter a name for your new character. Tap the link next to “Choose a name” and type in your character’s name. After that, just tap the link next to “Roll for your Vitality!” and your dice will be thrown out onto the table. You can shake the device to shake the dice. Once the dice come to a stop, your Vitality will be calculated (you roll different numbers of dice for different difficulty settings). Next, tap the “Fitness” link to roll for your Fitness as you did for Vitality. Your two main stats are your Vitality, which is how much life you have, and your Fitness, which is used to determine how well you can perform certain physical feats. Once your character is rolled, you are ready to begin the adventure! Just flip the pages as you would if you were reading a book, and enjoy the story. After a few pages, you will be presented with a choice. Select what you would like to do, and continue reading. Sometimes you will see choices that are shown with a red button. Depending on the choices you have made before, some things may not be available to you later on. However, the choices themselves often contain clues you can use for your next read through. Occasionally, you will come to a special link like a Fitness link, or a Fight link. 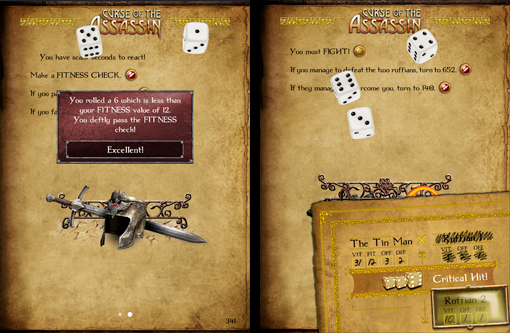 You won’t be able to move past your current section until you roll the dice to see how the fitness check or fight comes out. Once you have sorted out the rolling, one of the links will be available to take, depending on the outcome. During combat, you can also do Fitness Checks to try and hit your enemy harder, and you can drink healing potions if your Vitality is getting low. Finally, if you tap in the middle of the screen, or make an upward swipe gesture, then you will see some new icons at the bottom of the screen. 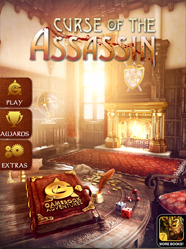 The book will return you to the main menu, the globe (sometimes a gear, depending on the gamebook) will open an option panel that lets you change the look and feel of the app. For instance you can change the font and the font size, among other things. Lastly, the backpack will open your character inventory sheet. The inventory sheet keeps track of everything you have picked up, as well as everything you have discovered. So if you discovered a clue, it would show up under the ‘Knowledge’ section in your inventory. As your quest progresses, your inventory will grow, simply slide the inventory sheet up to see everything that is on it. It also indicates your stats, such as Vitality and Fitness – so keep an eye on it! You can dismiss the inventory by swiping left to right, flicking it off the screen, or by simply tapping somewhere outside of the inventory. At the bottom of the inventory sheet are your bookmarks. In Adventurer and Casual modes, you have as many bookmarks as you like, but in Classic mode you only have six bookmarks – so use them sparingly! To place a bookmark, bring up the icons, and tap the ‘Bookmark +’ button in the top right. To use an existing bookmark, tap the ‘Bookmark’ button. Once you place a bookmark it cannot be moved, but you can use it over and over again. When you are presented with a tough decision, or a fearsome foe, it is a good idea to place a bookmark so that you can come back and try again if it all goes bad! That should be enough to get you started on your first Gamebook Adventure! 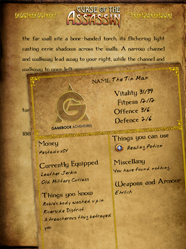 ← What is a Gamebook Adventure?